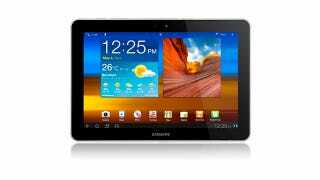 Thanks to the Apple vs. Samsung patent war, the Samsung Galaxy Tab 10.1 has been off the market here in the States due to an injunction awarded a month ahead of the big showdown. Now, a U.S. appeals court has ruled that it's time to reconsider that ban. When the jury decided the Apple vs. Samsung matter, they wound up pretty squarely in Apple's corner, but they also said that Samsung did not actually infringe on the patent Apple used to block sales of the Galaxy Tab 10.1. Logic would dictate that the ban should be lifted then, but it gets a little more complicated than that. Following the jury's ruling, Samsung jumped at the chance have the ban reconsidered, but hit a snag when U.S. District Judge Lucy Koh said she couldn't do that because Samsung had already appealed, and set that process in motion before the jury's wider patent ruling. This most recent ruling by the appeals court, however, says there's no need to wait on the appeal, and that Judge Koh can just go ahead and reconsider the ban.